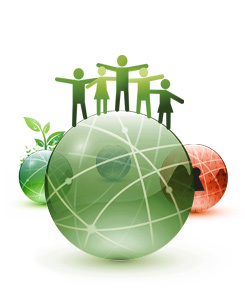 Corporate Social Responsibility: Is “none” even an option? One of the reasons I like my current employer is we are big on corporate social responsibility (CSR), and I mean BIG. If something happens locally, nationally or globally, the emails start flying and people start volunteering. It’s not just lip service here, it’s actually done. As an example, two days after I started my previous position, a corporate-wide email went out for supporting relief operations in Haiti complete with several ethical, trusted organizations recommended for Haiti recovery. I thought that was pretty cool! Where does CSR rank when you’re researching a company or organization? Is it a deal-breaker if the company doesn’t get involved? Or do you see it as an opportunity to start your own programs? This should be mandatory for all companies in the future!! It definitely raises the company’s “clout” factor in my mind. I do think we’re going to have to be the proverbial change agents if we find ourselves in a company that doesn’t support CSR (if it’s one of the things that matters to us, of course; one can substitute other needful things for “CSR”). For me, I get a stronger sense of belonging to something more than a widget maker. I strongly believe that if you value social responsibility then you will appreciate working or an organization that also values this trait. It will not only make you feel better but it will also make you want to work hard and champion your company due to this connection. For me it’s not yet a deal breaker, because not many companies truly tout this and live by it yet, but definitely helps me make a decision when I am considering where my next place of employment will be. I agree. When the company looks outside of itself and gives back to the community it resides in, that means something to me.